Make your website and content easy to share. In a 2010 social media study, 89 percent of Internet users said they actively share content. If you are on Facebook or Twitter, this should come as no surprise. Social sharing tools spread your content and brand across the web. What’s even more powerful is the return from social sharing by bringing even more visitors back to your website. AddThis.com is the world's largest content sharing platform. It gives visitors to your site a simple and easy way to share your content across the social web, and it provides you with increased web traffic and in-depth analytics. Did I mention it’s FREE? You simply go to their website at http://www.addthis.com, choose the button style that best fits your site, then AddThis.com gives you (or your website designer) a block of code (or a widget) that you place on your website. This gives people who visit your site an easy way to share it with their connections on Facebook, Twitter, or whatever their favorite social platform might be. With the analytics AddThis.com provides, you can see how many “shares” (and across what social platforms) you receive each week. Sharethis.com works just like AddThis.com. 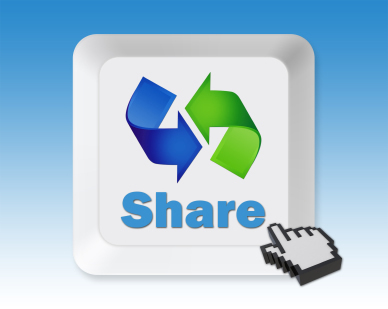 I like ShareThis.com because it’s a little more customizable than AddThis.com, however both work equally well. Their website is http://www.ShareThis.com. If you use one of these sharing tools, I recommend putting the widget on each page of your website. If you have an eCommerce storefront, you should include a sharing widget with each product, as well. The Facebook “Like” button lets a visitor to your website share your content with their friends on Facebook. When the user clicks the “Like” button on your site, a story appears in the their friends' News Feed with a link back to your website. With the average Facebook user having over 100 friends, it’s easy to see how powerful this is because more than 100 people will see your content. You can customize your “Like” buttons so they include faces of your Facebook fans, a “Send” button, and/or a live stream from your Facebook page. To create a Like button for your site, go to: http://developers.facebook.com/docs/reference/plugins/like/ . The biggest difference between the Facebook “Like” button and the AddThis/ShareThis option is the AddThis/ShareThis feature allows the end user to choose which platform on which they want to share your content. The Facebook “Like” button only shares it on Facebook. On my own websites and on my client websites, I use a combination of each of these sharing tools. The important thing is that you use at least one of them to give your website visitors the ability to share your content. With 89% of Internet Users indicating they regularly share content socially, you are missing an opportunity if you don’t give them an easy way to share the content from your website!